Our semi-automatic heat staking machines are ideal for inserting metal components into plastic assemblies. Choose a pre-designed, off-the shelf system or let our engineering staff customize a design to meet your specific tooling requirements. For the injection molder who is looking to add value, our heat staking systems may be used for a variety of products with easy change-over fixturing and PLC control for added flexibility. Our systems are designed for use by a single operator and can be integrated into your manufacturing cell to facilitate lean, continuous flow manufacturing. Our cost-effective Model HS-2 Heat Staking Machine includes a 2kW induction heating power supply and a custom-designed, four-position induction coil which is safely isolated from earth ground. The side-mounted control console includes start/stop push buttons which place the system into auto run mode. Full manual control is available for process development. In one common application, threaded metal ferrules are bonded to plastic automotive parts. Brass or steel ferrule inserts are first moved into position above corresponding holes in the plastic material. After the inserts are heated to the correct temperature, they are quickly pressed into the plastic. The plastic immediately surrounding the inserts melts and flows into the knurl areas. The plastic then cools and securely holds the metal gaskets in position. 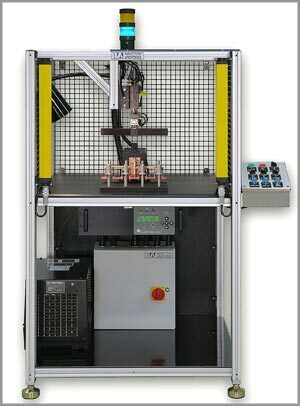 Our heat staking machine fits in your manufacturing cell.